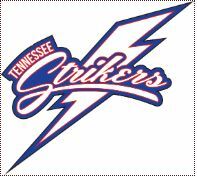 Tennessee Strikers comes to LaVergne! We are so pleased that the city has entered into a new agreement for youth baseball and softball. There have been some ups and downs over the last seven or eight years – from the city hiring its own athletic director to run a league to going through a league affiliated with MLB. Here’s hoping this time it sticks!! Players between 3 and 16 years old have the opportunity to practice in baseball and softball in a variety of levels including recreation and travel. Available programs include baseball and softball t-ball, 6U, 8U, 10U, 12U, as well as softball 14U and 16U. Registration is $100 for T-Ball through 8U and $120 for 9U and up. Registration includes a shirt, hat, pants and belt for each player. Registration is open to anyone wanting to participate in the ball league. As I understand, scholarships are available in the event that the registration fee is too challenging to overcome. Time to bring our youth back to our own fields! Spread the word and encourage your neighborhodo children to come on out! Reach out to the organization… if you follow the link “From the city” it’ll take you to the city’s web page and if they questions aren’t answered there, you can click through to the actual Strikers page.